Up until using Sweyn ForkBeard Beard Shampoo I haven’t used a shampoo or wash that is specially formulated for beards, I have just used a normal shampoo, I couldn’t see the point, after all its just hair! So when this beard shampoo from Sweyn ForkBeard arrived for review, I have to admit that I was sceptical. I wet my beard and applied a few of pumps of the shampoo into my hand and worked it into my beard, I paused and did as I usually do a “I know that smell”, I make a point of not looking at what essential oils are used as I like to see if I can figure it out first and then look. This has a very subtle smell of wood and a forest, its not a shampoo that produces a mass of lather but that could be down to the water, our water is very hard in Essex and you get less of a lather with soaps, shampoos etc. with hard water. I have very dry hair and my beard is normally a nightmare, but this beard shampoo did leave my beard feeling softer and not as dry, it turns out that a shampoo that is created for beards is better than a standard hair shampoo. 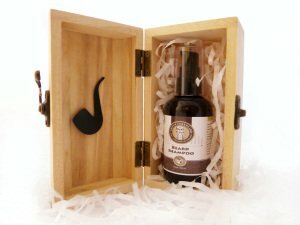 Its a 100 ml/3.5 oz bottle with a pump dispenser and costs £12.95, but there is the option of having it in a wooden box for £14.95 and if its a gift for an extra couple of quid, its extremely worth it. Our Beard Shampoo is a handcrafted combination of 100% Natural & Organic Cedarwood, Scotch Pine Needle, Rosemary and Fir Needle Essential Oils, Coconut Oil, Aqua, Sodium lauryl sulphate, Cocamidopropyl betaine, Cocamide DEA, Phenoxyethanol, Sodium chloride, Potassium sorbate & Sodium benzoate, Citric acid. Keep Your Beard clean & full of it’s Natural Oils. Works best when used daily along with Sweyn Forkbeard Beard Oil. Used to help lock in moisture and reduce frizziness, making your beard and moustache easy to manage. With each day of using Sweyn Forkbeard Shampoo you’ll notice your beard feeling cleaner and stronger. To use: Best when used in the shower. Create rich lather with fingers, rinse well, dry, and finish with one of our Beard Oils, Beard Balms or Moustache Wax. Handmade in small batches by our master blender, supplied in a 100 ml/3.5 oz amber plastic bottle with pump. Made in UK without Parabens, Sulphates, artificial fragrances and colours which makes it ideal for all skin types including sensitive skin. It is suitable for vegetarians and has not been tested on animals. Their website also has a selection of Beard oils, Balms, Moustache wax, Aftershaves and dare I say it “shaving cream” *shudders*. They also sell some Sweyn ForkBeard clothing and gift sets in those gorgeous wooden boxes. There is also information on their namesake Sweyn ForkBeard who was the first Viking King of England in the year 1,013. So get on over there and have a look at their website. ← Advice needed about elective amputation!